With cherry, you'll build projects that get better looking with age. 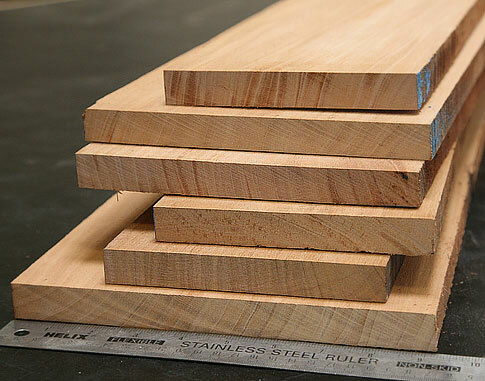 Freshly cut or sanded cherry has a light tan color but it soon transitions to a more stately and classic russet color. This cherry lumber has one of the highest possible heartwood specifications in the industry, called 90/70. That means 90% heartwood on the face, and 70% on the back. Heartwood content may be greater on some boards, but can not be guaranteed. 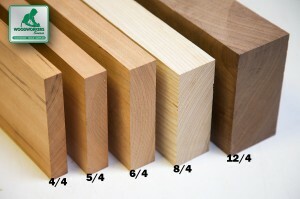 Cherry lumber comes in random widths and lengths, with a uniform thickness. Also known as 8/4, S2S. Woodworkers go to bed at night thinking about cherry. What else is like it? Virtually nothing. That beautiful red color, fine grain, and phenomenal performance with hand tools and power tools all make cherry a memorable and favorite wood. Reaches heights of up to 100 feet, about 80 feet average, with a tall trunk of about 24" in diameter. 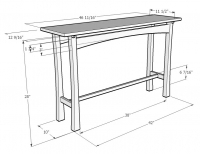 Cherry Dimensioned Thin Craft Hobby Boards 1/4" x 3.5" x 36"
What Does 8/4, S2S Mean? 10% heartwood on one side and ~70% on the other. Nice grain and figuring. After placing my order I realized that I needed to change length of the boards and sent email to correct the original order. When I received my shipment, the original dimensions were sent. Woodworkers Source expedited shipping of another board to make it right. Great lumber and great service! I asked for real clear wood and that is what they sent me. this will look great in my cutting boards. wood was very nice. I was making end grain cutting boards for Christmas gifts. It worked out perfectly. thanks!! Superb quality. First order from the source. Won't be the last. Small project that I needed the right stuff for and I found it at "the source".